Welcome to Bellegrove Dental Surgery. We have been established in the area for over 40 years and we have established an enviable reputation for good quality dental care. We have 3 fully equipped surgeries which deliver a full range of modern dentistry. We offer both NHS and private services. All routine procedures are carried out on site whilst more advanced procedures are referred onto local specialists. We take pride in the quality of our dentistry, and want to make your visits pleasant experiences. This means giving you regular dental advice and helping you to understand how to care for your teeth yourself to reduce the need for dental treatment. Our practice is based in a residential area of Welling in Kent. We are based on modern premises which have disabled access and a newly refurbished extended car park to the rear of the surgery. This allows quick, easy and FREE parking access to all our patients. Inside the practice patients can enjoy our newly refurbished premises which encourage our patients to wait in a relaxed, pleasant environment. We take pride in our friendly, professional team who are always available to meet your needs and to offer a personal service to you on all your visits. We are always happy to welcome new patients to our practice and offer a high standard of service to all. 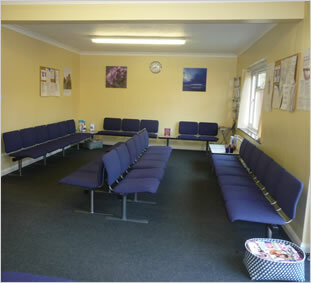 Our waiting area comprises of a childrens area in which our more younger patients can enjoy various activities such as colouring to take any stress out of visiting your dentist. Our dentists and dental nurses always endeavour to make dentist visits a fun experience for all our children. We also have a patient education area where you can educate yourself on various oral health issues. The surgery offers car parking for patients, and disabled access. We are located 5 mins walk from Welling station and a 10 min walk from Falconwood station. The following bus routes also stop nearby: 89,486,51,625,624,B15,B16,658.